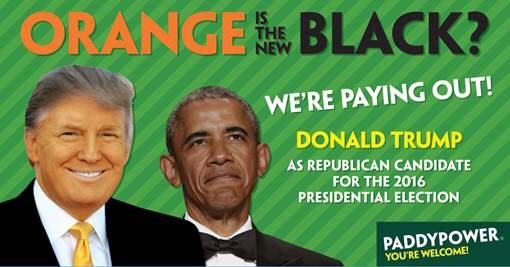 Paddy Power has seen enough and is paying out to punters who backed Trump to win the Republican nomination. They’ve released this risqué advert in order to publicise their political betting offering. Trump’s odds began at 100/1 and cut to 40/1 after he announced his intention to run for office in June. Paddy Power has taken over 1000 individual bets on Trump, with over 50% of all money going in his direction. One brave punter put £1000 at 25/1 and will now receive their £26,000 before the contest has concluded.